A few years ago I was co-organizer in Havana of a conference that eventuated in the publication of the book entitled Basques in Cuba (2016). My collaborator was a famed political exile and extraordinary figure in Basque letters, Joseba Sarrionandia. In addition to our conference we were working on an English-language translation of his poetry. That anthology is now completed and should be published within the next several months (our working title is “Prisons and Exiles”). But that is another story. Joseba insisted at the time that I consider arranging for English translation and publication by the Center for Basque Studies a book entitled A medianoche by a Basque former priest Javier Arzuaga. I read it as a favor and was dumbfounded. Arzuaga was the priest of the parish that included La Cabaña fortress, presided over by Che and the site of show trials, brief imprisonment and then execution of certain officials in the army and government of Fulgencio Batista. For the first four months of the process, Arzuaga was permitted to accompany condemned men for the few hours before their extermination. He was present at fifty-five executions before suffering a nervous breakdown. Arzuaga describes his encounters with Che and Fidel, as well as his own evolution as a supporter of the revolution to critic of it. He provides extraordinary human profiles of the revolutionary officials conducting the proceedings, as well as of several of the condemned men. Particularly riveting was his internal crisis of conscience, since Arzuaga had become estranged from the Catholic hierarchy (he eventually left the priesthood) and doubted the very message of redemption and an afterlife that he employed to console the doomed men. As a 78-year-old writer in the twilight of a lengthy career, I cannot begin to estimate how many books I have read—certainly thousands. Yet I can say that none has been more disturbing or memorable than At Midnight. A couple of months ago, I came across a few videos on the Nevada Arts Council website highlighting Basque culture in Nevada. Nevada Stories is an online video series focusing on folk and traditional artists, specific local traditions, and Nevada’s landscape. An outreach activity of the NAC Folklife Program, it supports the Nevada Arts Council’s mission to provide folklife education to all age groups and to highlight the individual folk artists, traditional communities, and cultural sites that make Nevada distinctive. Filming and production are funded through Folk and Traditional Arts grants from the National Endowment for the Arts. I’ll share the Basque ones here, but be sure to check out the website for more on the many cultures that comprise Nevada! Visitors to the 34th National Cowboy Poetry Gathering in Elko (2018)–themed “Basques and Buckaroos”–saw firsthand that Basques know how to have fun! A popular social pastime in the Basque Country involves bar hopping while sampling the pintxo (pronounced “peen-show”) or bite-sized snack specialties of the house. Our guest chef Asier Garcia hails from Bizkaia and is now a resident of Boise. Asier leads a workshop group through the intricacies of creating a dozen different pintxos, deconstructing this artful tradition to enhance their culinary repertoires and satisfy their appetites. Utah bandleader, contractor, Basque personality and cook Jean Flesher presents Basque cuisine in traditional fashion with a northern Basque country (French influenced) flavor. The workshop features classic dishes and cooking techniques. Participants learned new recipes (included in the video) and left with satisfied appetites and a full serving of Basque joi de vivre. This film was made possible by a grant from the National Endowment for the Arts and partnerships between the Western Folklife Center, Nevada’s Department of Tourism and Cultural Affairs, and the Nevada Arts Council. For more than half a century, Jean and Phillip Earl of Reno have used clues from old maps, letters, and books to hunt for and document “Mountain Picassos,” distinctive figures carved into aspen trees found in the high country meadows of the Great Basin. These figures– along with names, dates, and sayings– were carved by Basque sheepherders in the early to mid-20th century. For the last 50 years, Basque families from throughout the American West have gathered in Elko, Nevada on 4th of July weekend to celebrate their culture and the opportunities afforded them in the USA. Filmed over the three days of the 2013 National Basque Festival, “Euskal Jaiak: Celebrating Basque Culture” offers the viewer an all-embracing view of this multi-faceted event. Josu Erkoreka, secretary of Public Governance and Self-Government of the Basque Government and Iñaki Anasagasti, former Basque senator and Xabier Irujo, director of the Center for Basque Studies have presented a book on José Luis de la Lombana. On the 80th anniversary of the speech given by a young non-anglophone Basque at the Madison Square Garden in New York, a book about Lombana has been presented at the Sabino Araba Foundation in Bilbao. Both authors underlined that the book collects “the incredible trajectory of José Luis de la Lombana, a young activist of the Basque Nationalist Party, born in Gasteiz within a Basque nationalist family, which during the years of the 1936 war and the subsequent dictatorship carried out a great anti-Franco activity calling for peace in Europe and the Americas and for Basque freedom”. Erkoreka and Anasagasti -authors of recommended monographs on the contemporary history of Euskadi and the Basque Government, with the collaboration of Xabier Irujo- have detailed during the presentation Lombana’s life trajectory, from his education in Madrid, his participation in the anti-Franco resistance, his incarceration in Gasteiz, his departure to exile in France, his activism in Barcelona where he worked as an editor for the Basque nationalist newspaper Euzkadi, supporting the Basque Government in exile, and, finally, his long years of exile in Colombia. In New York, Lombana who at the time was only 27 years old found a society that was not so uninformed about the war and the Basques. The Americans had followed through the press the ups and downs of the war and had a fairly clear criterion around the Basque reality. But in the end Lombana outlined a rather “pessimistic” approach. In his opinion there was little to be done from America to help Europe in general and Spain or the Basque Country and Catalonia in particular. Very little. Both geographically and intellectually, the United States felt alienated from Europe and its social, cultural and political problems. The book also analyzes the first years of the delegation of the Basque Government in New York, three years before the arrival of Lehendakari Agirre escaping from the Nazis in World War II. There are also reports on the efforts to support the Basque Government in France and the United States and letters on the propaganda effort both in favor of Basque nationalism and the rebels and their international allies, Nazi Germany and Fascist Italy. Gaztemundu 2018 Applications Now Available! The Resolution for Gaztemundu 2018, was published this week in the Official Bulletin of the Basque Country. This publication triggers the application period for the program that will run September 1-16, 2018 in Vitoria-Gasteiz aimed at individuals between the ages of 18-35 from officially recognized Basque clubs around the world. This year’s Gaztemundu will focus on traditional Basque dance. 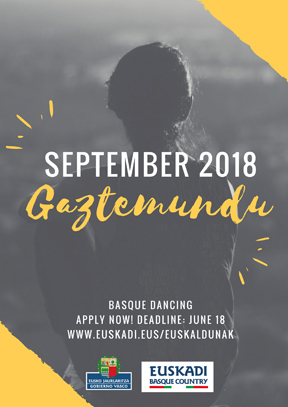 Eligible applicants will have knowledge of dance instruction and Basque dance, will be of age by January 1, 2018, and will not have participated in a prior edition of Gaztemundu since 2003. See basic requirements here. Applications require submitting a video recording of dance instruction to determine the capability of the individual to interpret, as well as explain the significance of a chosen dance. The jury will also take into consideration other points that are included in this article found on EuskalKultura.com. The deadline to apply is June 18th, and the Resolution is available herein both Basque and Spanish. For clarifications in English, please email: Iñigo Medina. Iñigo recently arrived at the Center for Basque Studies in Reno and will be carrying out a Basque Government internship, from the Directorate for Basque Communities Abroad, through January 2019. Iñigo has a wonderful command of the English language and so for questions about Gaztemundu, or any other Basque Government related issue, feel free to contact him. On behalf of everyone at NABO, we would like to extend a very warm welcome to Iñigo! USAC and NABO are excited to partner on the Carmelo Urza Scholarship for study abroad in the Basque Country. Dr. Carmelo Urza, founder and CEO Emeritus of USAC (University Studies Abroad Consortium), credits inspiration gathered from NABO and its member organizations, in helping him create USAC. 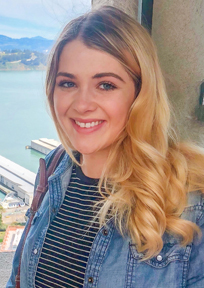 As such, a new $2,000 Scholarship is now available exclusively to students who are NABO members, or whose parents are NABO members, and are attending the USAC Bilbao or San Sebastian, Spain study abroad program during either fall or spring semester. Eligible students must have a 3.2 GPA or above, and the deadline to apply is April 1, 2018 for Fall 2018, and November 1, 2018 for Spring 2019. Complete information is available online at usac.edu/scholarships#urza and students are encouraged to contact scholarships@usac.eduwith any questions. The Center is proud to launch Echevarria, a novel in which dialogue is central, and to participate in the celebration of bertsolaritza at this year’s National Cowboy Poetry Gathering in Elko, Nevada. In that spirit, here are some more things you may be interested in! Much of what it means to be human is revealed through language and the spoken word predates its written counterpart by millennia. Indeed, whether we realize it or not, oral culture is at the very heart of the Western cultural legacy with the Homeric epics—the earliest works of Western literature—ostensibly oral in nature. Orality pervades Basque culture to this day and the Center’s publications reflect this fascinating dimension of the Basque experience in general. Voicing the Moment: Improvised Oral Poetry and Basque Tradition, edited by Samuel G. Armistead and Joseba Zulaika, is, to date, the most detailed study in English of the specifically Basque phenomenon of bertsolaritza–“versifying” or improvised oral poetry that is sung in different formal and informal contexts–and how this art form is part of the global oral tradition of verse. Likewise, Part I of Basque Literary History, edited and with a preface by Mari Jose Olaziregi, is devoted to oral literature, with chapters on the current state of orality as a literary form and the history of bertsolaritza. And beyond those works that specifically address Basque oral culture, it is interesting to note just how deep orality runs in the Basque storytelling tradition, whether it be in the form of tales from the Old Country as transcribed and discussed in Wentworth Webster’s charming Basque Legends, or the New World recollections of Joan Errea in her compelling autobiographical accounts of growing up in a Basque household rural Nevada: My Mama Marie and A Man Called Aita. And what better platform to reflect the influence of the oral culture storytelling craft than in literature for children and young adults? Oui Oui Oui of the Pyrenees by Mary Jean Etcheberry-Morton, is a whimsical story about the adventures of a five-year-old girl, Maite Echeto, her beloved friend Oui Oui Oui, a goslin. Meanwhile, renowned Basque author Bernardo Atxaga’s Two Basque Stories includes two tales framed around the relationship between grandfathers and grandsons that clearly reflect this oral storytelling tradition. Finally, for many examples of early bertsoak from the West, check out Asun Garikano’s Far Western Basque Country! Echevarria is a new house, a new world, etxe (house) berria (new). It tells one hundred years of solitude and family history in Elko, Nevada and the Basque diaspora. The new family in the West is the necessary and awkward melding of Basque, Mexican, Chinese and Anglo settlers on the frontier. The human family is eternal and inviolable and there is only one story to tell—the intersection of young boy and young girl and the eternity of love. Death is its companion. And at the center of their journey is Echevarria—the Basque hotel.